We develop leaders to challenge broken systems and accelerate positive change in Sub-Saharan Africa, Canada and around the world. At EWB, we think and act differently. Our work involves tackling the world’s most challenging problems to lift the collective prospects of our planet. As a result, we must invest in developing people with a specific set of qualities and abilities. We call this Systems Change Leadership. 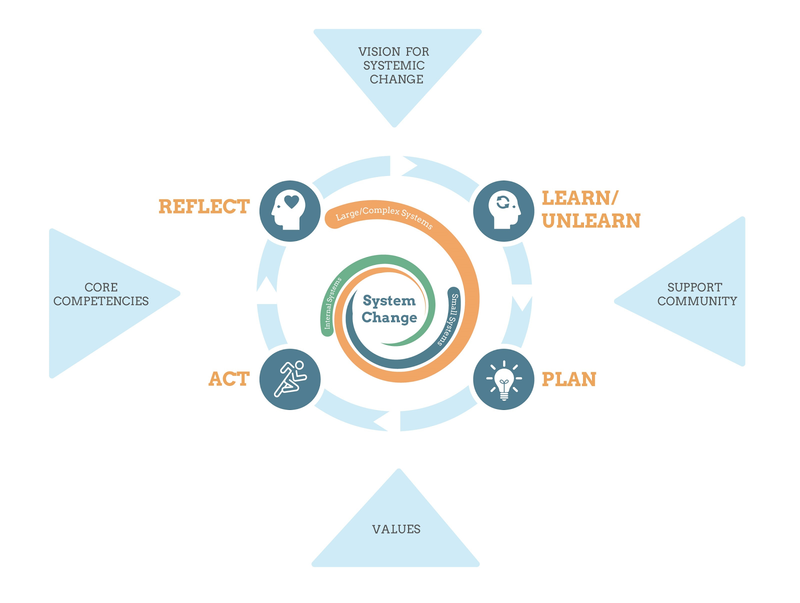 The Systems Change Leadership model equips participants with the skills, vision, values and strategies to create profound and positive change in the world. Systems Change Leadership: fostering pioneers. To create change, leaders must develop a strong understanding of the tiered nature of systems. Through identifying the various levels of ingrained social issues, we can address the root causes involved and leverage particular skills and strengths to work towards a thriving and sustainable world. There are three levels involved in creating systemic change. Fostering evolution within our individual mental, physical and emotional selves. Creating change in local, immediate environment; within teams, ventures and chapter-based initiatives. Learning skills to transform industries and sectors, on a national and global scale. Systems Change Leadership involves constant learning through action. And, the creation of sustainable positive impact as a result of a greater understanding of the world. We call this continual cycle ‘action-learning’. As a participant in EWB’s Systems Change Leadership model, we will help you build skills and create tools that enable you to take thoughtful and strategic actions towards change. Act: Take action to bring improvements or innovations in the world. Reflect: Think deeply about the experience to identify new opportunities or areas for improvement. Learn and unlearn: Grow our knowledge, skills and awareness, while abandoning ineffective ideas or ways of thinking. Plan: Develop a vision and propose a concrete course of action. Establish vision, become a visionary. We believe people can only solve problems when equipped with a greater perspective—a comprehensive understanding of the wider issues and influencers involved in a system. Systems Change Leadership empowers you to adopt that overarching perspective. We teach skills to establish and maintain an effective understanding of large and small systems, with the ultimate goal to identify and eliminate the root causes of poverty and inequity within them. There are six steps involved in establishing potent vision and enacting change. Start by clearly defining the impact we want to bring about. Consider the key components of the system or problem, so that every action targets a root cause. We learn best by being open—being receptive to ideas from anywhere and anyone, and being open about our mistakes and failures. True change requires a movement of forward-thinking leaders. We support and invest in each other to build a movement together. Commit to your own personal growth through regular self-assessment. Have the courage to ask for feedback. Scrutinize the past, present and future to determine opportunities for impact. Make the impossible possible. The recipe calls for imagination, hard work, innovation, passion, and a willingness to take risks. The core competencies of Systems Change Leadership. Drawing on our extensive experience and collaborative work with many social change organizations, we have identified five core competencies that are critical to leading change. The continuous development, practice and refinement of these competencies is essential. Understand the elements and actors within a system to identify the root of a problem and develop approaches to address it. Think deeply about your actions and approach. Engage in collaborations with strategic and unexpected partners to develop a comprehensive vision and shared action. Transform a vision into concrete, strategic actions, and find the resources to do so. Participate as an active citizen in society, and influence decision-makers through advocacy, key stakeholder engagement and partnership development. Build a life aligned with who you are and the world you are striving to create. Join a network of like-minded change leaders. We foster a diverse community of Systems Change Leaders. Anyone can practice Systems Change Leadership and play a role in driving innovation and impact. We find strength in numbers. Our support network is a powerful resource—a rich matrix of motivation, energy and skills tailored to tackle complex challenges and create lasting change.